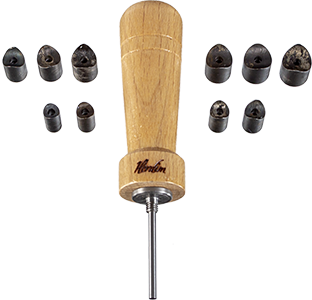 More Product Info: The ideal tool for cutting perfectly cylindrical f-holes in cello. Centered drill bit w/ beechwood handle. Incl. 10 double-beveled drill bits: 12, 12.5, 13, 13.5, 14, 18, 18.5, 19, 19.5, & 20 mm. 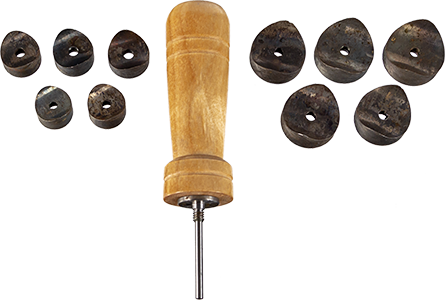 More Product Info: The ideal tool for cutting perfectly cylindrical f-holes in violin / viola. Centered drill bit w/ beechwood handle. Incl. 10 double-beveled drill bits: 5.5, 6, 6.5, 7, 7.5, 8, 8.5, 9, 9.5, & 10 mm. More Product Info: Special flat mortice chisel with short blade (50 mm) and tapered cross-section for the head and frog cavities of bows. Pearwood handle. 2 mm width. More Product Info: Special flat mortice chisel with short blade (50 mm) and tapered cross-section for the head and frog cavities of bows. Pearwood handle. 3 mm width. More Product Info: Special flat mortice chisel with short blade (50 mm) and tapered cross-section for the head and frog cavities of bows. Pearwood handle. 4 mm width. More Product Info: Special flat mortice chisel with short blade (50 mm) and tapered cross-section for the head and frog cavities of bows. Pearwood handle. 5 mm width. More Product Info: Aluminum bending clamp for violin, viola and cello bow tips. More Product Info: Bow rehairing tools - set of three. High carbon steel, tempered to 65 Rockwell. More Product Info: Wood. Holds bow securely while rehairing all size bows. More Product Info: For measuring the precise amount of hair needed for tying a given hank. Stainless steel with slit & graduation scale. Suitable for all size hanks. More Product Info: Combing bow hair prior to use helps guarantee that the hair in the hank remains straight and parallel. These combs have cleanly cut teeth and are made of natural horn. Overall length 90 mm. Comb length (toothed portion) 50 mm. More Product Info: Combing bow hair prior to use helps guarantee that the hair in the hank remains straight and parallel. These combs have cleanly cut teeth and are made of natural horn. Overall length 90 mm. Comb length (toothed portion) 85 mm. More Product Info: Scale measures from 440 gm to 0.1 gm. Cover acts as a tray. More Product Info: Jennings JT2 Tabletop Scale. Measures from 1000 gm to 0.1 gm. Cover acts as a tray. Batteries & AC adaptor included.